Typically self-congratulatory blog posts about all the cool visual things that will make you–the reader–better off accompany website launches such as this one. One of my colleagues may yet write that post. I am not. I am writing a blog post about all the cool stuff that you don’t necessarily see. Or the stuff that powers the stuff that you see. It’s kinda geeky that way. Nginx is the new hotness in webservers. It’s fast, which is good, but more important is that it scales consistently. My Apache VPS (from a typical LAMP stack) would be all over the place in terms of server usage where my Nginx server stays constant. This is awesome and it means less 500-series server errors. Server usage on my Nginx VPS. Yeah, the resources are higher but that’s because there are a bunch of sites running. More importantly, the usage is relatively flat. WordPress. Making WordPress websites is my full-time job but it also happens to be the best CMS out there. The heart of GeekyLibrary is a plugin I wrote to handle the book reviews we call our library. I’m going to talk a little WordPress here, so forgive me if you don’t speak that dialect of geek yet. Each library book is a custom post type with a pretty significant UI overhaul (more on that in a second). It’s linked to the Authors custom post type by way of Posts 2 Posts. We’ve also added a book genres custom taxonomy. There’s some more admin UI work that could be done here in the future. 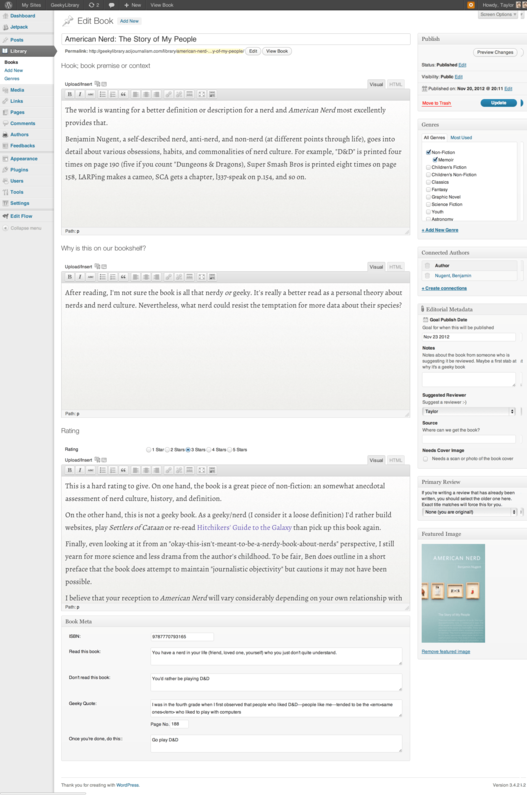 The UI for the book custom post type removes the post_content wp_editor. We use post_content, but it’s never edited directly. Instead we have several custom wp_editors loaded right after the title thanks to the new WP 3.5 action hook “edit_form_after_editor” Thanks Helenyhou! Each wp_editor that we’re adding relates to a specific part of a review. We have the intro/hook, explanation of our rating, and why the book is on our bookshelf. When the post/book is saved, those editors are concatenated and inserted into post_content. They’re also saved separately as post meta giving us several different ways to display posts. The ISBN is then used to query the Powells.com API. The ease of querying the Powells API is awesome. It’s a simple RESTful API accessed via GET requests. Super simple. The only trick is that data isn’t necessarily available via all ISBNs a book might have. So we query twice: once with the ISBN input, then again with the UPC that Powells has on file. The latter ensure we can get a proper affiliate link and book review info. We cache that information as post meta and refresh it rarely. We’ve built-in the ability for multiple book reviews on the site. For example, I could go back and write a book review for The Hitchhiker’s Guide to the Galaxy, because I feel three stars is a disservice. We want to only present one review in the Library: a canonical review. So, the first person to write a review wins out and every other person reviewing a book writes it as a child post of the original. Those secondary reviews won’t show up in the library, but will be given some linkage from the canonical review. There’s also a link from the secondary review back to the main one. In order to get the library to show the correct books and the reviews to show sibling and parent reviews took some query manipulation, which was fun. No website is created in a vacuum. Well, maybe, but it’d be difficult to work near the rollers, especially if it was turned on. GeekyLibrary was created with a bunch of different tools. Bitbucket: The GeekyLibrary theme and the custom library plugin are both in their own private git repo thanks to Bitbucket. Right now it’s a manual deploy process by SSHing into the server and git fetch/merge from the Bitbucket remote. Photoshop: It’s where the geekylibrary header, apple-touch-icon, Twitter avatar, Facebook avatar, etcetera were born. It’s my office for both work and hobbies such as this (Geeks talk about hardware, what can I say).